What do you do when your students get stuck on a word? Do you vary the prompt based on the word, the student, the situation, or the text? If you do, great! 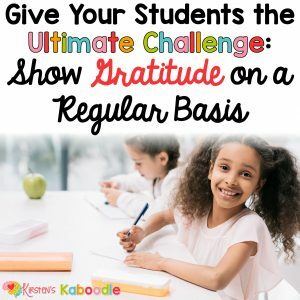 If not, you may want to consider varying your prompts in order to provide your students with the tools they need to become more fluent readers. Each prompt below is followed by an explanation of the circumstances that might call for that particular prompt to help with reading fluency. When a student gets stuck on a word, this is NOT the same as saying “sound it out”. In most instances, I choose not to use that prompt because it implies that each letter has it’s own sound and does not take blends, digraphs, or other word parts into consideration. If the child is staring at a word and having difficulty, take a look at the word and see if there are familiar parts in the word. Take the word INDEPENDENT, for example. There are three parts in that word which can help the child. If you ask the child to look for a part they know, perhaps they’ll find in, pen, or dent. Blending the parts together is much more efficient (and accurate) than isolating individual sounds. On the other hand, if the word is something like THOUGHT, it would not be a good time to ask the child to find a familiar part because there aren’t any. Use this prompt when you are confident that the child can identify familiar parts. It’s always a good idea to explain the prompt to the child prior to using it. 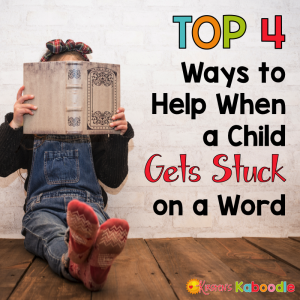 You might say something like, “When I ask you to find a part that you know, I want you to be a detective and search for a smaller word or words inside the big word.” Show the child multiple examples by flipping through a book and choosing words that have known parts. 2. Just read the word for them! No, you’re right, that’s not the prompt. There are definitely times when you can save the child from the frustration of figuring out a difficult word. If the child is reading a proper noun and it doesn’t follow regular spelling patterns, tell him/her the word. Specific names of people, places, and things that are not familiar to the child should be an automatic told once you see the child is struggling. The same holds true for words that have multiple irregularities in the spelling. I will not sit by and watch a child struggle with a word like PHLEGM. It’s a waste of their time and only serves to increase frustration. With unique words like this, I may also make a quick comment about the word, “Sometime PH makes the F sound. This silly word ALSO has a silent G! What a goofy word!” Depending on the age of the child, I might deliver the comment dramatically. When we use this prompt, we are asking students to use the meaning in the passage to help them figure out an unknown word. This is appropriate when the fluency in the sentence is so interrupted that the child wouldn’t even recognize whether or not a particular word would sound right or make sense. For younger children, it might also involve checking the pictures to support the meaning. “Can the picture help you?” is a great way to direct attention there, if it will help. This prompt is appropriate when the child has made an attempt at the word and is somewhat close. “Think of a word you already know that sounds like the word you just said,” is a great way to help students know that they are close, but need to adjust a vowel sound or something similar. After the child has tried a couple of times unsuccessfully, I will tell him/her the word. You don’t want to spend a ton of time on any single word because, at that point, the flow of the passage gets so interrupted that the meaning gets lost. Students should be reading material that is on their reading level. If the child is getting stuck on a word (or words) in every single sentence, the text is too difficult. The frustration level, the number of stopping points, and the interruption in the flow of the story will make reading much too laborious. Reading should sound like talking. Some students have been taught that the faster you read, the better. That’s true to some extent, but have you ever heard a child read more than 200 words per minute? I’m not sure about you, but it leaves me feeling exhausted! As someone on the receiving end, it is much TOO fast to be enjoyable. For these students, let them know that it’s okay to slow down so that reading sounds like natural speech. Teaching students to listen to themselves when they read is imperative (and is a topic for a different blog post, which will be coming soon). Reading is not just about calling out words accurately. It is about extracting an understandable message. Until students can integrate the visual cues (reading words correctly), meaning cues (does the text make sense? ), and structure cues (does it sound right? 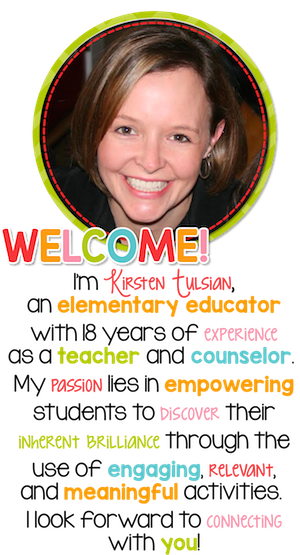 ), they will struggle to be fluent readers. Students will naturally read nonfiction text slower than fiction. By definition, nonfiction text is much more technical and the likelihood that student are exposed to unfamiliar words goes up dramatically. 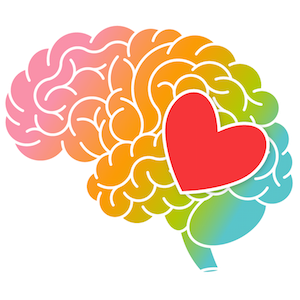 Processing nonfiction text takes more energy, brain power, and analytical ability, which undoubtedly compromises fluency. Teach parents to use appropriate prompts with their children and you will see benefits across the board. 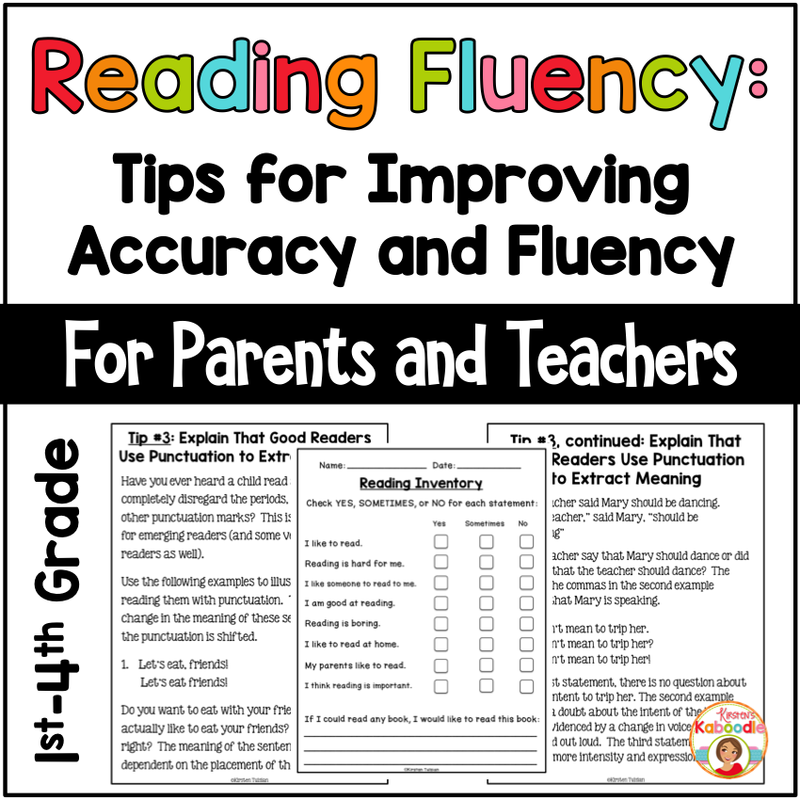 If you need a resource that will assist parents, you can give this fluency product a gander. What other prompts do you use with your students? 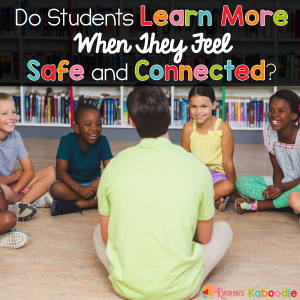 Have you found other effective ways to help students improve their fluency? Share your thoughts in the comments! « Is Compassion Something That Can Be Taught?